The Nvidia GeForce RTX 2070 is interesting insofar as a number of partners and retailers have stuck to the £459 price for cards clocked in at stock speeds. EVGA, MSI, Zotac and Palit all have custom-cooled offerings that are based on the reference PCB, and knowing there isn't massive overclocking headroom for the new GPU, the question of spending more, potentially lots more, on a fully-custom design rears its head as we look further up each company's stack. Palit is an excellent case in point. The reviewed RTX 2070 Dual ships at that £459 price point. Sure, it's no looker, but good temps and noise readings means it's a safe buy at the right side of £500. Yet that is only one of seven RTX 2070 cards in Palit's stable. Standard versions of the JetStream, GamingPro and GameRock are augmented by further overclocked versions of each. 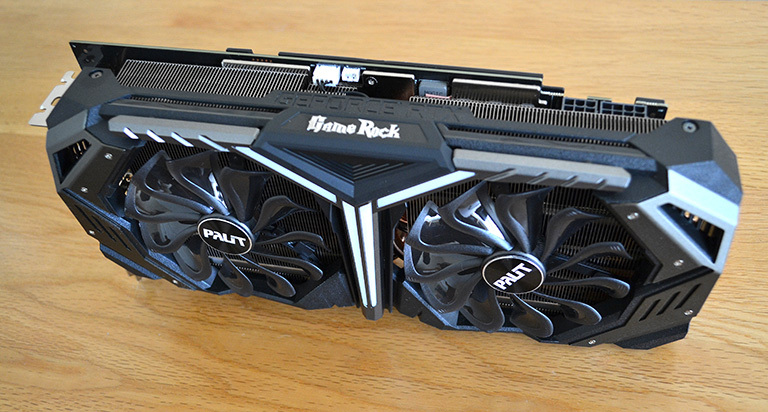 We guess you can't criticise Palit for a lack of choice, and we have the top dog GameRock Premium in for review today. 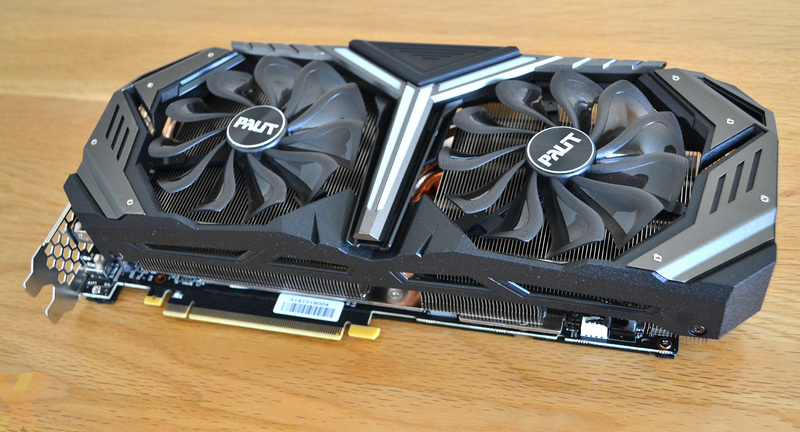 As is the norm, Palit uses the same cooler on the speedier RTX 2080 but, interestingly, goes for only the GamingPro and Dual for the headline RTX 2080 Ti. Go figure. The card's giant shroud looks like something you would get if you crossed a transformer with an owl, and the end result isn't particularly pleasing to the eye. It's an acquired taste, to say the least, yet even if you happen to love the design, the choice of construction material leaves something to be desired. The shroud is made primarily of plastic that flexes all too willingly, and simply isn't befitting a product of this ilk; such coolers have sufficed for many years, but Nvidia's Founders Edition has raised the bar, and we get the feeling the days of plastic coolers on premium products are numbered. You'd usually expect to see a surfeit of RGB lighting on cards built this way. Surprisingly, that is not the case, as the only illumination is the Y-shaped strips between the two fans. By default, the colour represents the temperature, with green indicating sub-50°C, blue 50-80°C, and orange above 80°C. As you will see later on, we never saw the orange in evidence. There's no extra lighting on the sides, behind the GameRock or GeForce RTX printing, meaning that, when installed in a chassis, light only bathes the bottom section, generally not visible to the user. A strange decision, for sure. What's more, the accompanying ThunderMaster software looks clunky and doesn't offer, on the face of it, any way of changing the colours yourself. 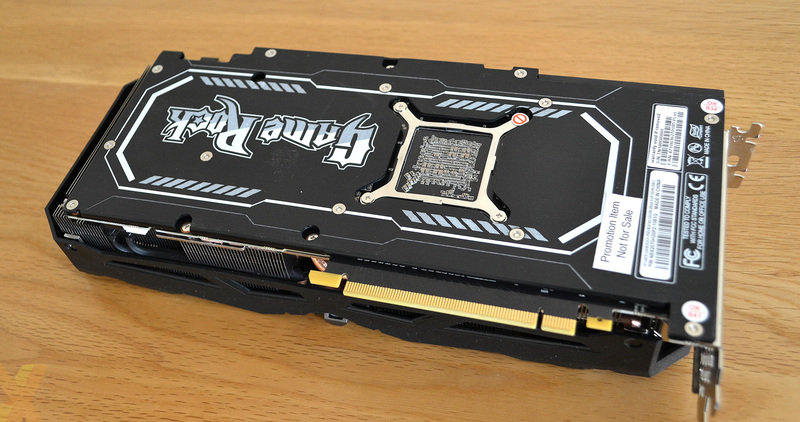 That hulking cooler takes up the better part of three slots, with such height caused by having very tall aluminium fins across the card. 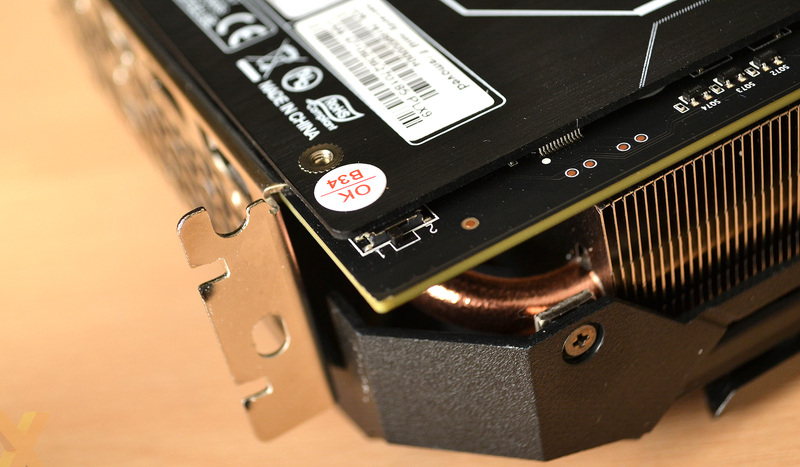 Palit uses five 8mm-thick heatpipes which make contact with a thick copper insert that, in turn, sits on the GPU. There's a large base plate offering a combination of rigidity and greater cooling surface area. Palit makes use of this by having thermal pads between it and the memory. That's not all, though, as the VRMs have their own dedicated base plates that you see next to the six-and-eight-pin power connectors. Cooling is suitably robust, perhaps overkill for such a card, leading to a 1,315g weight. There's no support bracket provided in the package, but thanks to a card-wide rear heatsink, emblazoned with the GameRock logo, the card doesn't sag. It's no shrinking violet, either, measuring 292mm x 130mm x 59.5mm, and its physical presence overpowers mid-sized chassis. You certainly wouldn't want two of these in a small-ish system - not that you can, as Nvidia doesn't support SLI - and we're a little concerned the open-sided design means that hot air will generally recirculate inside the case. All this cooling prowess ought to lead to decent speeds... and it does. The standard RTX 2070 clocks in at 1,620MHz boost. Palit's GameRock ups this to 1,725MHz, which is about par for the OC course. This GameRock Premium, using exactly the same cooling, cranks up the core to 1,815MHz though the 8GB of GDDR6 memory is left at 14Gbps. A guaranteed core speed of 1,815MHz appears to be the RTX 2070 limit, so Palit gets top marks here. Just behind where the NVLink connector would normally go is a tiny BIOS switch that's easy to miss. Its purpose is two-fold: to enable the card to boot in the unlikely event the original BIOS is corrupted, and to put the two fans into zero-dB mode when temperature is below 60°C. The latter is standard for most of the industry, but it is worth knowing that, as shipped and in position one, the twin fans never shut off. Given that the frequencies are the same in both positions, we don't know why Palit doesn't adopt the zero-dB mode as standard - the cooling is certainly up to the task. There's no change in terms of display outputs, with GameRock Premium Edition's mesh I/O panel sensibly sporting the standard selection of three DisplayPort 1.4, HDMI 2.0b and USB Type-C.
We have skirted pricing thus far because this version is not available to buy right now. We know the standard GameRock, using ostensibly the same cooling and PCB but clocked in at 1,725MHz boost, is priced at a considerable £565. Such information leads us to believe the GameRock Premium will be closer to a jaw-dropping £600.